Have you ever encountered the condition when you record videos with iPhone, there pops up a message saying “no storage space”? Indeed, videos take up too much storage space of iPhone, so, to free up iPhone’s space, the best solution is to reduce the size of iPhone videos. 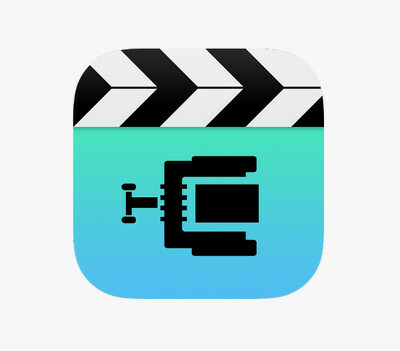 Here, we will share with you two direct ways on how to compress iPhone videos. iPhone has the outstanding iSight camera and can support recording 4K videos, which makes it one of the best mobile devices. So people love to record their wonderful moments using iPhone. But the high quality comes with a price: the size of video files becomes larger and larger, which causes too much trouble, like no storage space or failing to send via e-mail. There is parameter for reference: iPhone can shoot 4K videos, but the videos will take up 350MB of iPhone’s storage space every minute. Surely it’s annoying because iPhone’s storage space is so limited. So how to compress iPhone video for email? Here, we will share with you 2 methods to reduce iPhone videos’ size. HD Video Converter Factory Pro offers you the overall solutions on how to reduce iPhone video file size. You can change the bit rate to resize iPhone videos, compress the iPhone videos using an advanced encoder or use the advanced Compression Setting in one click. All the features are self-explanatory so you can easily compress any video as you wish. 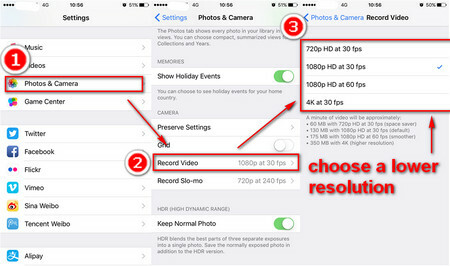 iPhone supports changing the resolution before capturing videos. So, if you want to compress videos on iPhone, you can follow the steps to compress videos directly on iPhone. First, go to Settings, the select Photos and Camera. Scroll down and tap Record Video, then, there will be 4 different resolutions, just choose the lower resolution to compress iPhone videos. This method will make you lose the original quality of iPhone videos, and the picture of videos will be less clear. So, if you want to reduce iPhone videos yet preserve the high quality, then, an HD iPhone video compressor is exactly what you need. Although we can reduce iPhone videos’ size by lowering the bit rate, the videos’ quality will definitely be damaged. So, is there any way to keep the original quality while compressing video size. Here, we highly recommend to you HD Video Converter Factory Pro. For it can compress videos with original quality preserved. For example, it can compress 4K videos with the highest quality, compress AVI videos, and also can compress audio files. 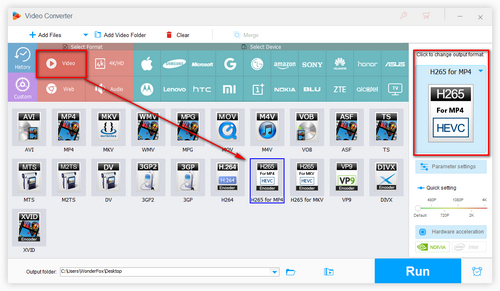 Therefore, with HD Video Converter Factory Pro, you can easily resize iPhone videos without any quality loss. Now, let’s follow the process to reduce iPhone video file size. Before we start the process, just free downloadfree download HD Video Converter Factory Pro and install it on our computer. To compress iPhone videos, first, launch the easy-to-use iPhone video compressor on your computer, then click “Add Files” to add your iPhone videos to the program, or you can just drag and drop them to the main interface. As we know, the recorded iPhone videos are mostly encoded with H.264 encoder. And as the successor of H.264, H.265 performs better on compressing videos. It can keep your iPhone videos’ quality the same as much as possible when compressing to smaller size. So, if your iPhone supports H.265 encoder, we suggest you to reduce iPhone videos’ size with H.265 encoder. 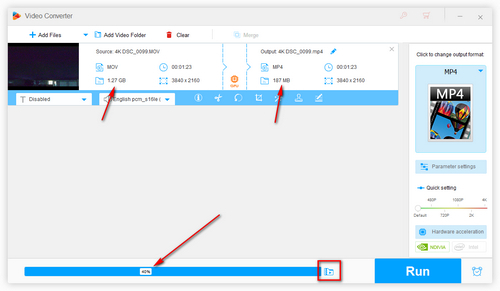 First, click the Output Format window on the right of the main interface and select H.265 for MP4 under the Video tab, then, click RUN button to wait for the compression process. On the other hand, if you don’t know whether your iPhone supports H.265 encoder, you can just check the “Compression Setting” in the bottom of the main interface and drag the bar to control output video file compression ratio. Or you can simply click the Settings button and change the bit rate on the Settings window. In order to keep your iPhone videos in a good quality, we suggest not adjusting the compression settings bar or reducing the bit rate too much. After you have finished the iPhone videos compression process, do not forget to transmit the converted videos back to your iPhone with Wi-Fi or a USB cable. Need to Convert Your Compressed iPhone Videos to Other Formats? Try This One! As we have mentioned above, you can easily compress iPhone videos even without any quality loss using HD Video Converter Factory Pro. 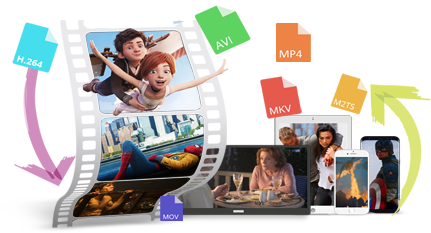 But what if you want to convert the compressed videos to other formats, like converting MP4 to MPEG for making VCD/DVD, converting MP4 to WMV, or even convert videos to audio file. Don’t worry. HD Video Converter Factory Pro is also completely qualified for the tasks. HD Video Converter Factory Pro is the most professional audio and video converter, supporting converting to 300+ audio/video formats and devices. It supports multi-core CPU and GPU acceleration to convert a large file in an instant. More importantly, it is 100% safe and clean, with no worry of privacy leakage. Do you have some audio or video files to convert? Do not hesitate and have a free try now.